The refreshing chilled tomato soup meets a classic cocktail, the Bloody Mary. No booze needed to get the vibe going here! 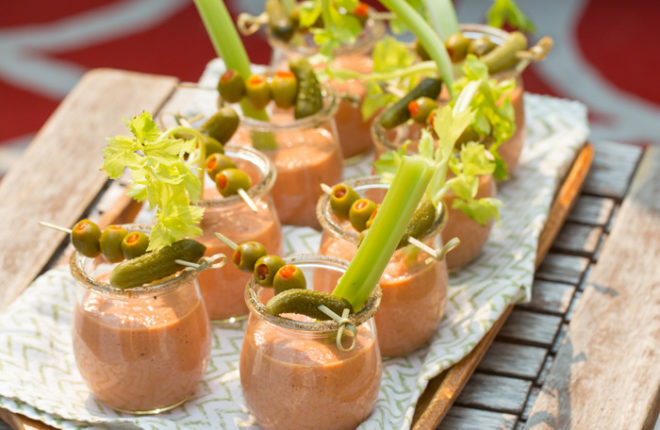 Love passing this perfect summer party appetizer. I’ve been dreaming of a Bloody Mary Gazpacho for awhile now. 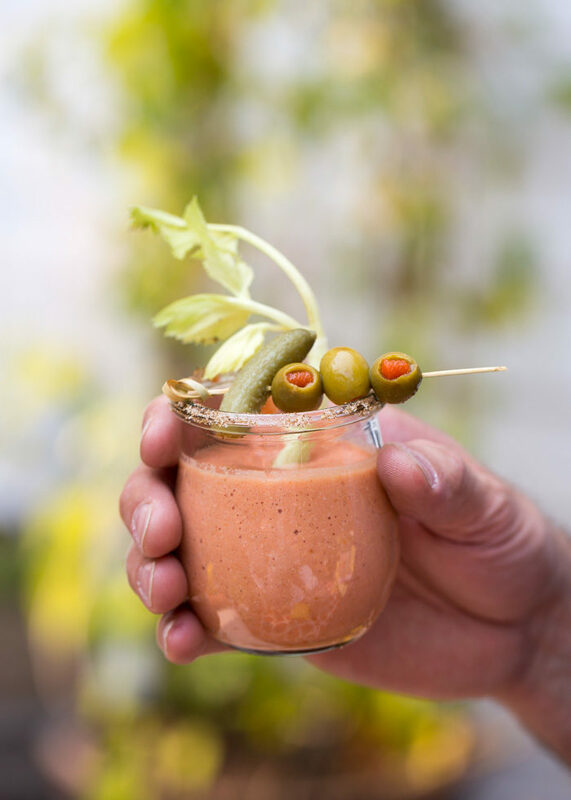 It just seemed like the perfect hybrid of a recipe – cold, refreshing gazpacho with a kicky Bloody Mary twist, garnishes and all? Heck yes! 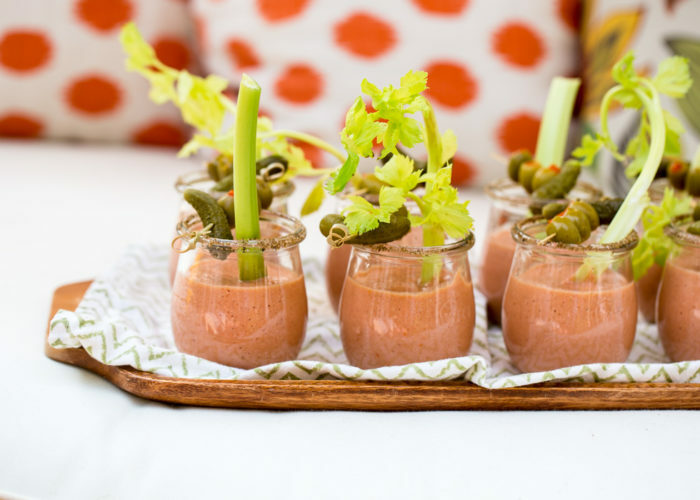 So when I decided to serve a chilled soup shooter recipe for my plant-based canapé party, I thought it was the perfect time to bring the idea to fruition. No pun intended. You know, because tomatoes are a fruit? This recipe has a longer list of ingredients than most of mine do. That’s because I wanted to get a little more fancy schmancy than my norm for my class. But this soup is still super simple to make – just throw the ingredients in the blender, pour into glasses, garnish, done! 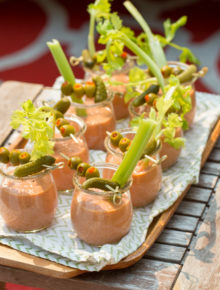 Flavor-wise, it took me a bit of tinkering to get the gazpacho just right. In the end, two traditional ingredients – almonds and bread – got the texture to where I wanted it. Yep! Almonds and bread. Not necessarily something you’d expect, just looking at it, but there you have it. (Note that you can totally leave one or both out if they seem weird to you – the soup might just be thinner and not quite as full-bodied). Tomato juice, on the other hand, is not necessarily a traditional gazpacho ingredient, but I felt this one needed it to make it more Bloody-Mary-like. 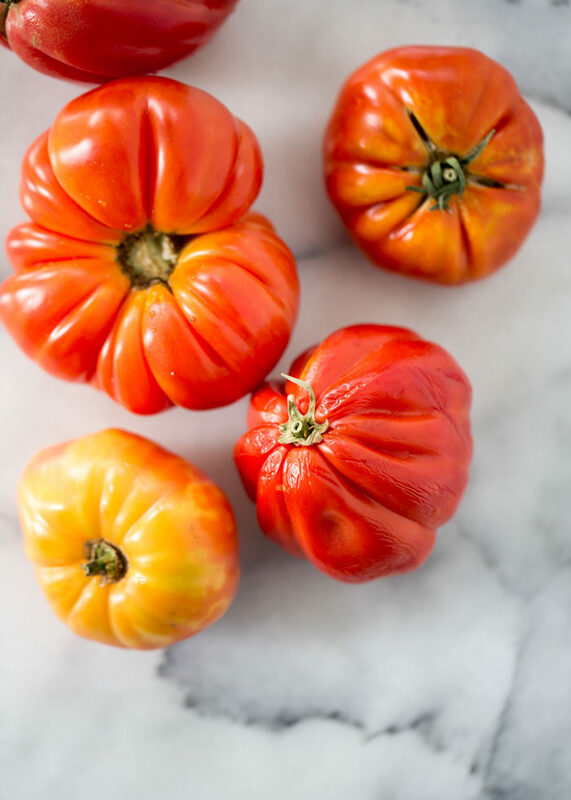 And then we have shallots, garlic, tomatoes, cucumbers – stuff you’d find in a regular gazpacho that gives it heaps of flavor. Along with Worcestershire, horseradish, and Tabasco. Because hello Bloody Mary. But the best part of this recipe is how you dress it up. 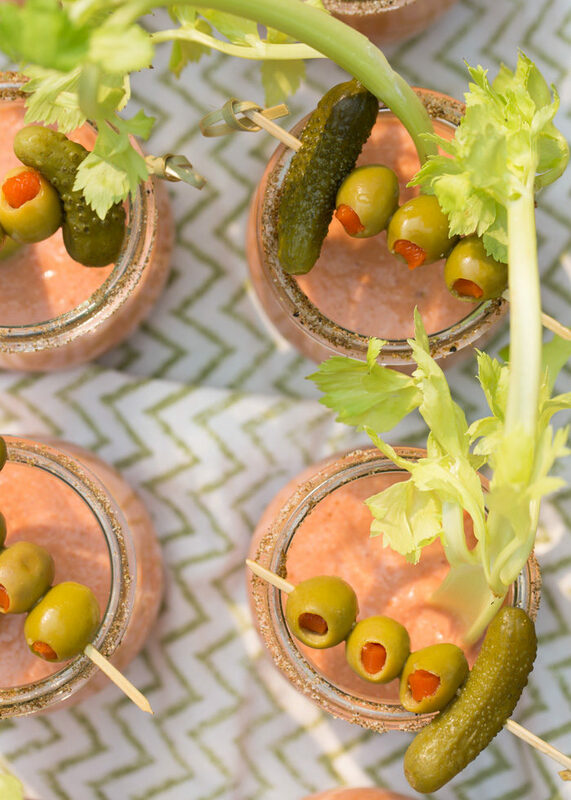 I used cute little 1/2 pint Weck jars dipped lightly in a mix of celery salt and freshly cracked black pepper, assembled skewers with green olives and a baby pickle, and then plopped a celery stick in for good measure. It’s a salad … it’s a soup … it’s a mocktail … it’s whatever you want it to be! Oh, and it’s really really tasty, too. Creamy, zingy, just the right amount of spice. I love how refreshing this soup is on a hot summer day. Tip: Make the soup and prepare the garnishes ahead of time, then refrigerate overnight or even for a couple of days. 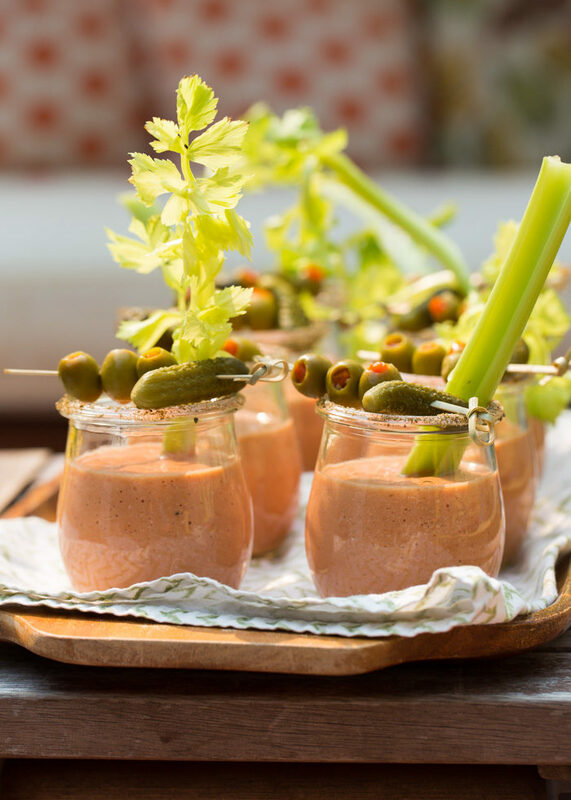 The flavors of the soup will have longer to develop – making it even more tasty – and serving these Bloody Mary Gazpacho Shooters to guests will be a breeze. 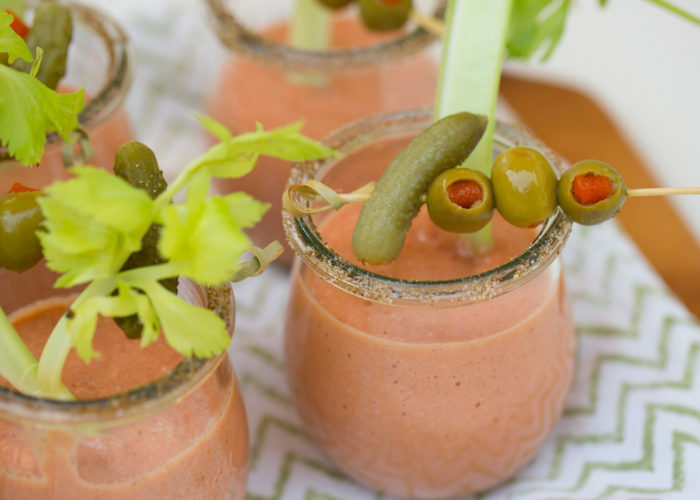 To the pitcher of a blender, add the tomato juice, tomatoes, cucumber, shallot, garlic, almonds, bread, lemon juice, vinegar, horseradish, Worcestershire, cumin, 20 dashes Tabasco, 1/4 teaspoon salt, and 1/8 teaspoon pepper. Puree until smooth. Taste and add more Tabasco, salt, and/or pepper if desired. Transfer soup to the refrigerator for at least 30 minutes, or up to two days if making ahead of time. When ready to serve, add the celery salt and 1/4 teaspoon black pepper to a small plate and stir with a small spoon to mix. Wet the rims of eight jars with the lemon wedge and dip the rims into the celery salt and black pepper mix. Carefully pour the soup into the jars, dividing evenly between the jars. Place three olives and one pickle on each skewer and balance on the rim. Plop in a celery stick. Arrange on a tray and serve immediately. You can make the soup and prep the garnishes hours or even a couple of days before serving. Just refrigerate until it’s time to assemble. These shots look amazing! I’ve never rimmed my drinks with black pepper. Definitely learned something new today!